Justine McGrath is a writer based in San Diego, California. She recently visited Columbus, Ohio, eating and exploring her way through the city to discover the best spots in town. When she’s not working, she’s traveling to faraway lands or hunting for the perfect burrito in her neighborhood, Pacific Beach. When you think of fast-paced American cities laden with cultural stops at every turn, Columbus, Ohio, might not be the first destination that comes to mind – but it should be. The rapidly growing Midwestern hotspot is home to some of the best restaurants, and friendliest people, in the country. Not to mention the city is where Ohio State University is located, which means residents are usually decked out in scarlet and gray on weekends. With locally owned shops and bakeries at every corner, and picturesque historic neighborhoods that would catch the eye of any Instagram influencer, Columbus is the place to be. When you’re ready for your trip to the Buckeye State, check in with our Columbus travel guide for what to see and do. Trust us, you’ll thank us later. Columbus restaurateurs are keenly pursuing the farm-to-table movement. They’re also big into creating dishes that appeal to any palate or budget. Before you head off to a local brewery for a cold one or a distillery for a swanky happy hour, hit one of these locations to satisfy your stomach. Any Ohio State athlete will tell you that starting the day off with a delicious breakfast is key to success, both on and off the field. Pistacia Vera – Owned and operated by a dynamic brother-sister duo, Pistacia Vera is a cult favorite around town. The shop, with multiple locations throughout C-bus, specializes in pastries. Feast your eyes on macarons that would make a Parisian blush, or chow down on a delicious plate of salmon tartare paired with a crunchy baguette for brunch. Flowers and Bread – This beautiful café located in a suburb of Columbus, Clintonville, offers exactly what its name suggests: flowers and bread. A full on bakery, café, and florist shop, Flowers and Bread is your one-stop shop in Columbus for everything beautiful. Not hungry enough to stop for a bite? Take a floral arrangement class or learn how to make sourdough bread – you can come back in the morning for a fresh tart cherry raisin roll. Katalina’s Café – With an extensive menu influenced by Latin flavors, Katalina’s is a local legend – and beloved by OSU students. Get there early to beat the crowd, and don’t forget to order a cup of Shagbark black bean soup (you might be thinking, “Soup for breakfast?” but trust us, it works). Top Left: Yelp/Aaron H.; Top Right: Yelp/Steve A.; Bottom Left: Yelp/Michelle M.; Bottom Right: Yelp/Bryant M.
Fox in the Snow – Located in the city’s Italian Village, Fox in the Snow is something you must experience in Columbus, Ohio. Serving up scrumptious pastries and an abundance of fine coffee, this place embodies the word “cozy” to the fullest. With a huge focus on locally sourced, seasonal ingredients, and a flair for creative pairings, the culinary scene in Columbus can’t be beat. Service Bar – The long awaited restaurant from local distillery, Middle West Spirits, brings together classic cocktails and killer food. Come in for the hipster ambiance and dim lighting, and stay for the carrots prepared 10 ways and the delicious lamb dumplings. The Guild House – Looking for flavorful food inside the Short North? Chow down on smoked trout with avocado and toast, or opt for sumptuous ahi tuna ribbons in a yuzu sesame dressing. The Guild House’s fresh take on American dining will have you convinced that locals are in on something the rest of the nation isn’t – Columbus is the promised land. Basi Italia – Tucked inside the city’s Victorian Village neighborhood, Basi Italia offers a peaceful respite from the hustle and bustle of downtown Columbus. This cozy space serves up classic Italian dishes with straightforward ingredients and touches of innovation. Get some plates to share for the table, including the zucchini pronto and parmesan crème brulee. North Market – Traveling with a large party or feeling peckish? Head to North Market. The expansive public market is home to dozens of vendors, from beloved local ice cream shop, Jeni’s, to Nepalese and Tibetan dumpling stand, Momo Ghar. Grab gifts for loved ones back home or feast on a hot piece of pizza then and there. Ray Ray’s Hog Pit – Open Thursday through Sunday, this food truck serves the best barbecue in town. Offering mouthwatering meats that are smoked up to 16 hours and homemade banana pudding that will make you forget all about your workout regime, Ray Ray’s has become a major fixture in the area, despite the restaurant’s mobility. When you’re not feasting on smoked brisket or sipping on a craft beer at a local brewery, there are plenty of other fun places to go in Columbus, Ohio. Culture – From the Columbus Museum of Art to the Billy Ireland Cartoon Library & Museum, there are lots of places around the city to immerse yourself in art. Pop into an innovative gallery and communal studio space, Blockfort, to chat with local artists, or go see a live show at the Ohio Theatre. Family Friendly – Columbus and kids go together like scarlet and gray pairs on a Buckeye. Take your little ones to make their own scented souvenir at The Candle Lab, or spend time with some furry friends at the Columbus Zoo and Aquarium. The Franklin Park Conservatory and Botanical Gardens are a great place to teach your little ones about photosynthesis, or to simply stop and smell the roses together as a family. Local History – There’s nothing quite like meandering around German Village with a hot cup of coffee in hand, admiring the historic architecture, and popping into local boutiques. Italian Village is a treasure in its own right, with beautiful parks and stunning homes to admire. Sports – No matter what time of year you visit, you can settle in alongside a Columbus sports fan and cheer your lungs out. The Ohio State University Buckeyes rule college football in the city, and Columbus Blue Jackets dominate the ice during hockey season. Columbus has something magical to offer its visitors any time of year, but these events keep people coming back to the city like clockwork. The Arnold Classic – Also known as the Arnold Sports Festival, this annual bodybuilding competition is hosted by none other than Arnold Schwarzenegger himself. Held each year in late February or early March, it is one of the most respected body building events of its kind. There’s so much love for The Governator in Columbus that the city erected a bronze statue of Arnold back in 2012. Find the statue on North High Street, and don’t forget to snap a picture of yourself imitating Ah-nald’s pose. Columbus Asian Festival – Occurring in late May, this massive 2-day festival showcases Asian art, food, dance, and more. As one of the largest events of its kind in Ohio, Columbus Asian Festival hosts nearly 100,000 visitors annually. This event began in 1995 and continues to excite locals and visitors to this day. German Village Haus und Garten Tour – Imagine a historic neighborhood full of brick-lined houses and well-maintained lawns. Picture yourself sauntering through one of these home’s gardens and feeling for an evening that you too are part of this idyllic community – and you can be, by attending the German Village Haus und Garten (House and Garden) Tour. Check out the beautiful houses and masterful interior design inside some of the city’s oldest homes during this annual June event. HighBall Halloween – Lots of cities in America get into the Halloween spirit, but Columbus goes above and beyond your spooky expectations. This 2-night affair happens each October, and brings together some of the most creative minds in the city. Featuring live performances, a couture fashion show (with work by brilliant local designers, such as Celeste Malvar-Stewart), and enough partying on the streets of the Short North to keep the college students satisfied, HighBall Halloween is a decadent autumnal celebration. Left: Nina WestFlickr/Becker1999; Top Right: Columbus PrideFlickr/Becker1999; Bottom Right: Axis Nightclub Yelp/Matthew U.
Columbus is a Midwestern hotspot for the gay community. Home to numerous nightclubs, decadent restaurants, and a booming business district and cultural scene, there are a few things LGBTQ travelers should know about before embarking on their Ohio getaway. 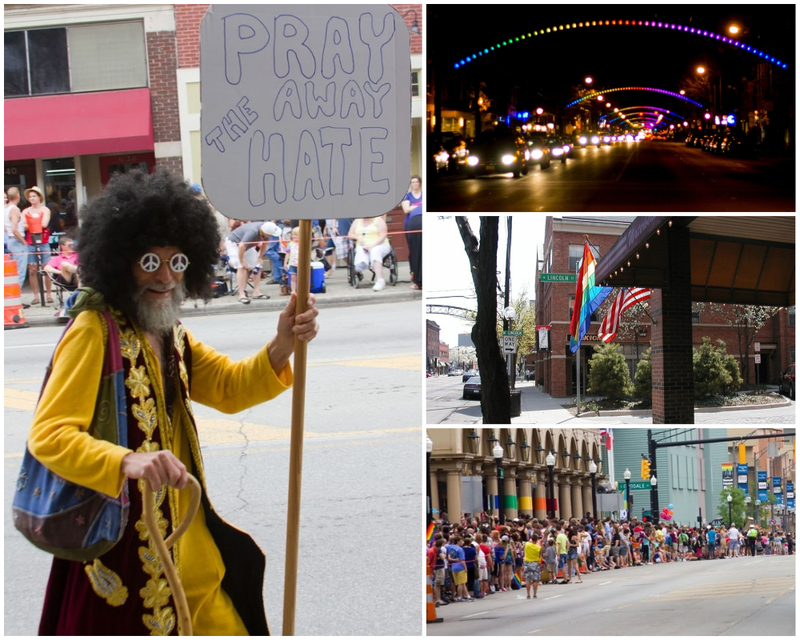 Columbus Pride Parade – With one of the largest pride parades in the region, Columbus’ annual Pride celebration in June brings together over 500,000 people. The 3-day celebration features live entertainment, the aforementioned parade, and joyful parties popping up throughout the city. With a different annual theme and visitors attending from all over the world, the spirit of Columbus Pride is festive and inspiring. LGBTQ nightlife – There are gay bars throughout the city, but many can be found in the Short North Arts District as well as near German Village. From the booming beats of Axis Nightclub to the rainbow flag-bearing Irish pub in town, Cavan, there’s a social watering hole that will appeal to everyone in Columbus. Nina West performances – Known as a local legend, seeing a performance by Nina West the “Super Drag Queen” should be at the top of your travel itinerary. Nina West is regarded for her bold fashion choices, singing, dancing, and joke-laden appearances throughout Columbus. West is known on a national scale, but her performances in Columbus are especially packed, as she’s celebrated as a hometown hero. There’s a place for every weary traveler to lay their head in Columbus. After a full day of sightseeing and snacking your way through the city, you’ll want to retire to one of these cozy accommodations. Looking for art and intrigue? Le Méridien Columbus, The Joseph offers a stunning art collection throughout the property, as well as the gorgeous Soul bar for spirited happy hours and tasty appetizers. In the mood to snuggle up with your sweetheart? Book a room at the Harrison House Bed and Breakfast. Located within a Victorian style house, the minute you walk into the Harrison you’ll feel like you’ve been an Ohio local all along. Hitting the town with girlfriends? Go for a pampering, old-school vibe that will have you feeling like royalty by trip’s end. The Westin Columbus is a recently remodeled property with state-of-the-art facilities, despite it being drenched in Old Hollywood glamour. Want something classic and comforting? The Hilton Columbus Downtown is in close proximity to the Convention Center, and offers the inviting amenities you’ve come to crave. Take a dip in the hotel pool before hitting the town, or pop into Gallerie Bar & Bistro for an opulent bite to eat. Need space for the entire family? The Hampton Inn and Suites Columbus Downtown has the space and amenities you and all your kin need to have an excellent trip. Stretch out inside your spacious room or take the kids for a stroll through the downtown district, where there’s something for people of all ages to enjoy. What are your favorite things to do when you travel to Columbus, Ohio? I’m ready to go to Columbus! Hope I win $500 in order to help me go in style. Cap City Diner is the best restaurateur in Columbus. Tee Jaye’s is second! I love to go see my Son at CCAD! It’s an Amazingly Awesome art college! I love going to the antique shops and have an Amazing cup of coffee and a very nicely tanned pastry! Have to say Hangover Easy is a great place for breakfast. Our favorite.